Smooth Velour Fabric with Vivid Zebra Striped Patterns cut a striking accent on classic black polyester “Rome” cloth (feels like neoprene!). Calm down the flashy theme of animal print with ComfySeats newest design – Velvet Animal. 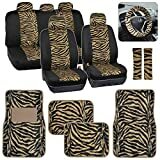 A classic remake of the original full patterned cheetah print seat covers. A must-have accessory for today’s modern drivin’ girl. Protect your interior from unwanted and unforeseen damages, dirt, mud and every thing else that attacks the interior of a busy traveler. But don’t just think of defense and preservation – go on the offense with style: Show off a fun and unique character! ComfySeats Velvet Animal seat covers series feature polyester blended fabric to create a smooth velour feel without sacrificing a thing in terms of durability. >Designed for a snug, comfortable fit to accommodate any necessary customization. Because of our patented new design, installation has never been easier! Front seats slip on with a simple round-the-back velcro loop. Bench seats, as always, require a bit more work – be prepared! This set includes standard hookloops for use in tightening the cover to each seat piece. The total package! Each set includes seat covers for front driver and passenger seats as well as top and bottom pieces for rear bench placement. 5 Separate headrests are included (many sedans now have 3! headrests for rear seating). And 4 Carpet Floor Mats!